The 1996 Olympics were meant to celebrate the 100th anniversary of the modern Olympics, but instead on day nine of the Games a bomb exploded at Centennial Olympic Park leaving two dead and more than 100 injured. The 1996 Olympics were meant to celebrate the 100th anniversary of the modern Olympics. Instead, terrorism, logistical nightmares and over-the-top commercialism marred the event. What took place in the early morning hours of July 27 left a lasting memory on the Atlanta Games. For the first time in 24 years, terrorism reared its ugly head at the Olympics. Not since the 1972 murders of 11 Israeli athletes had there been such violence at the event hailed as a symbol of world peace. On day nine of the Atlanta Olympics, a bomb exploded at Centennial Olympic Park, leaving two people dead and more than a hundred injured. Richard Jewell, a security officer at the Games, who had found the bomb, was wrongfully fingered as a suspect, and became the target of a media witch-hunt for the culprit. While lax security measures in Atlanta were not fully to blame for the bombing, the same cannot be said for the rest of the Olympic organization. The transportation system was overcrowded and chaotic. Bus drivers — who were brought in from around the country — were not properly trained, resulting in many athletes being shuttled to the wrong venues and others showing up for their events with only minutes to spare. There were stories of buses breaking down and countless delays for athletes and media personnel. The computer system caused further glitches. The computerized scoring system was slow in releasing results and failed frequently. In one instance, the $40-million system incorrectly awarded records to all the weightlifters in one event, including the two athletes who failed the lift. The organizers' blunders couldn't be blamed on lack of money. Previous Olympics had enjoyed corporate funding, but Atlanta ushered in a new era. The world's largest sporting event was turned into the world's biggest marketing tool. Multinational corporations' products and logos where omnipresent throughout the Games, with Coca-Cola — whose head office is in Atlanta — leading the way. Atlanta featured other, more positive firsts, too. Mountain biking and beach volleyball were included as full-medal sports, along with lightweight rowing, and women's soccer and football. Perhaps the Olympiad's signature moment came before any event began. Former Olympic boxing champion, Muhammad Ali (named Cassius Clay when he won in 1960), lit the Olympic cauldron, his hand trembling as a result of Parkinson's disease, as the crowd roared. American athletes would harvest the most medals in Atlanta with a haul of 101. Carl Lewis won the long jump to become only the third person in history to win the same individual event four times. Michael Johnson won the 200 metres and 400m, as did France's Marie-Jose Perec, marking the first time that feat occurred in a non-boycotted Olympics. Michael Johnson would become the main attraction in Atlanta, with a double gold victory in the 200m (and new world record of 19:32sec) and 400m. Johnson had been present in Barcelona four years earlier and was the favourite to win the 200m, having won 29 straight finals until Namibian sprinter Frankie Fredericks finally pipped him to the finish line in a lesser meet. However, on July 13 Johnson fell victim to a bout of food poisoning after eating at a restaurant. He failed to recover fully and was eliminated in the semi-finals. Five weeks prior to the Atlanta Games, the Texan athlete displayed his intention to dominate the 200m by beating a long-held record. Set in Mexico by the Italian Pietro Mennea in 1979 (19.72), Johnson duly obliged his fans with a time of 19.66. In Atlanta, Johnson was joined on the start line by some formidable challengers, including Fredericks and Ato Boldon from Trinidad and Tobago. But Johnson found himself alone coming out of the bend following a perfect start. All that remained for him to do was to focus on the finish line and keep his short, sharp, strides powering home. After crossing the finish line, the man best known for this particular running style was overjoyed at learning that he had again bettered the world record — this time by a more significant margin. He found it difficult to express his joy at this achievement, the noise from the stadium being so overwhelming. "I have never heard such an explosion at the finish line. It's the greatest thing I have achieved in my life," Johnson said following his victory lap, whilst an ecstatic public joined in the celebration shouting "USA, USA." Johnson had to top off his win by running his victory lap with a strapped leg due to a muscle strain that, unfortunately, would keep him out of the 4x400m relay. Undoubtedly, this prevented him winning a potentially easy third gold medal. The 1996 Olympics would also be Canada's best-ever medal total in a non-boycotted Olympics, with 22 medals, including three gold. The Canadian talent was spread around a number of sports, but the focus was on the men's sprint team in two of the most glamourous events of the Olympics. Sprinter Donovan Bailey captured two gold medals as the most visible and celebrated member of the world's fastest core collection of four or five men. Bailey was crowned the world's fastest man with a world record run in the 100m. 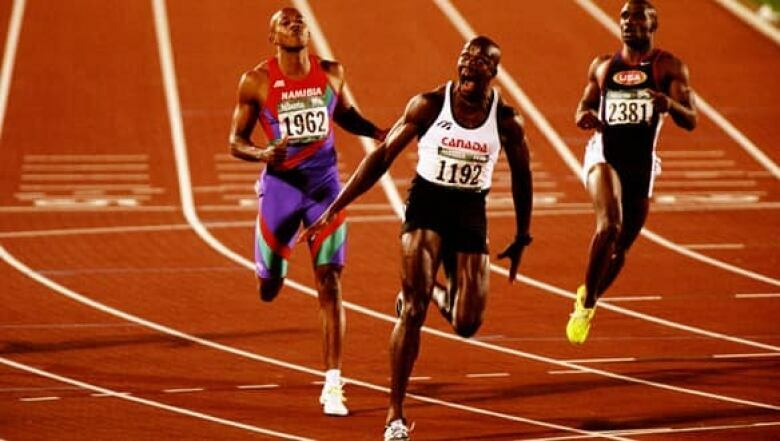 He was joined by sprinters Bruny Surin, Glenroy Gilbert, Robert Esmie and alternate Carlton Chambers in defeating the highly touted Americans in the 4x100m relay. The Canadian men's relay team more or less fell apart by the Sydney Olympics, but in 1996, it was a team in the truest sense, all the members playing their roles perfectly: Esmie was a great starter, Gilbert was one of the best in the world at clean exchanges and running the turn, Surin was one of the top 100m runners in the world, and Bailey was, well, the fastest man in the world in the mid-1990s. Canada's other gold medal was claimed by rowers Marnie McBean and Kathleen Heddle in the double sculls, the third gold medal they teamed up for in their Olympic careers. Double medal winners in Atlanta were also to be found on the pool and road. Curtis Myden won two bronzes in the 200m and 400m medleys. Clara Hughes equalled that result with a pair of third-place finishes in cycling, six years before she made history by becoming the first Canadian to win medals at both the Summer and Winter Olympics.